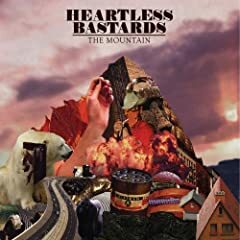 The Heartless Bastards' The Mountain is one of my favorite albums of the young year, and the duo's most sonically adventurous to date. Willie Nelson's album with Asleep at the Wheel backing him, Willie and the Wheel is out this week, as is Phosphorescent's Wilie Nelson covers album, Phosphorescent: To Willie. Other discs I have heard and can recommend are Marykate O'Neil's Underground, Ben Kweller's Changing Horses, Dent May & His Magnificent Ukulele's Good Feeling Music of Dent May, Howlies' Trippin' with Howlies, The Pains of Being Pure at Heart's self-titled album, and The Von Bondies' Love Hate and Then There's You. Among the week's reissues, the remastered My Life in the Bush of Ghosts by Brian Eno & David Byrne is finally available on vinyl. Secretly Canadian's reissues of History of Zero Boys and Vicious Boys by the Indianapolis punk band the Zero Boys are also worth checking out.